1.Each voter must supply a valid email address in order to participate. 2.Only One entry per email address. 3.Multiple entries from the same computer or IP address will be limited and subject to examination for duplication. 4.Only online ballots will be accepted. 5.The Bakersfield Californian and Bakersfield.com reserve hte right to disqualify obvious duplicate entries. 6. 50% of your ballot must be filled out in order to submit. 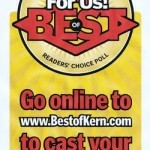 Results for Best of Kern County will be published in April Bakersfield Life! vote In Your Wildest Dreams for BEST ANTIQUE STORE!